Please come, and please bring all your friends. 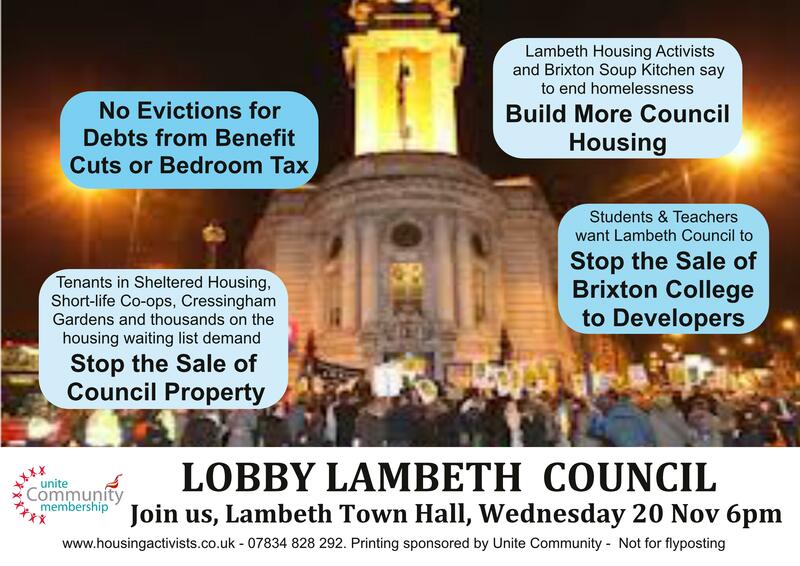 At a recent meeting between Lambeth officers, the council’s chair of housing and ‘shortlife’ housing co-op tenants under threat of eviction, the proposal for a ‘Super Co-op’ was pushed aside by a last minute agenda change. In an example of some sleight of hand corporate manoeuvring, the agenda points discussed at the first Super Co-op meeting in November 2012 were jettisoned thanks to a communication sent by the council leader, Cllr Peck, on the Friday before this Monday’s meeting. What should have been discussed was a solution to the upset and upheaval caused by the policy of ‘shortlife recall’ – a solution that allows housing co-op residents to stay in their homes of up to 40 years and that offers a borough-wide social value by taking on empty homes to refurbish them. Instead there was an attempt by Lambeth to shoe-horn ‘shortlifers’ into the ‘model co-op’ that was mooted in the 2011 Housing Commission – a proposal that so far Lambeth has made no progress on – crucially this ploy means that our request to stay in our homes has been denied. Meanwhile, Lambeth say that cannot cannot legally leave us in situ – but they will not explain why, despite past precedents to the contrary. Unfortunately, the hi-jacking of the agenda is a move that seems to typify the way that Lambeth has treated ‘shortlife’, e.g. pulling out of permanency deals and neglecting the houses and leaving it to us to maintain them. The impasse that has been reached means that the council will continue to spend money on lawyers, vacant property managers, contractors and auctioneers in their efforts to purge housing co-op communities that have been in existence for nearly 40 years. 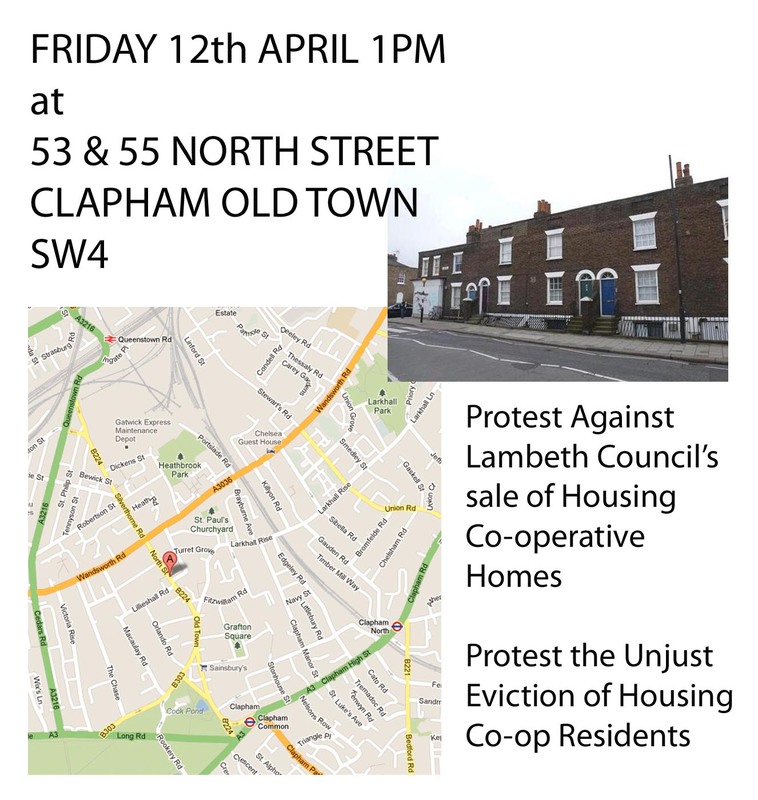 It also means that Lambeth will continue an action that its own co-op commissioners have criticised and has even come under fire from the people who come to buy our homes at auction viewings, many of whom choosing not to attend the subsequent auction. Rather than back a proposal that could have kept people in-situ and taken other people off the housing waiting list, Lambeth’s punitive legal campaign will add people to that list who do not need to be there. You can help put the Super Co-op back on the agenda by lobbying Cllr Peck and Cllr Robbins and supporting those councillors who have in turn supported the work of Lambeth United Housing Co-operative. When you are told to your face by a councillor that your community has brought “a welcome permanence and continuity to the area” and yet that councillor refuses to defend that community, you start to wonder about the moral compass that is guiding the borough. It’s in your hands to put this perception right and make Lambeth a truly “co-operative council” or let this episode remain a stain on this aim. Posted: December 16, 2012 by blackdaffodil in Cutswatch, Demonstrate, Rally & Occupy! We had a lovely Friday afternoon protesting the latest auction viewings of Lambeth’s ‘short-life’ cooperative housing, housing in bad condition that decades ago was squatted or given to people on the housing waiting list for them to occupy and make liveable in return for rent. This week it was 10 and 21 Lillieshall Road in Clapham, just a five minute walk from Rectory Gardens. Apologies for the photos, my phone was clearly a little damp! But it only adds to the atmosphere. We started out in the rain, and the reporter and the BBC cameraman were looking quite bedraggled as I walked up a few minutes late to join everyone, but spirits were high. Residents not at work were also out, and did the most beautiful job of engaging those who had come to see the residences before auction. Julian has been quite brilliant in mobilising and bringing all of the residents together, below you can read his text for the deputation that the ‘short-life’ cooperatives sent to Lambeth Council. It lays out the importance of keeping this housing and the multiple vague statements of support and promises that have been made by Lambeth’s representatives. The auction itself is taking place Mon 17th December, 12 noon, Hotel Russell, Russell Square. Be there if you can! …and the complete nonsense that label has become nearly 40 years later! …it threatens some of Lambeth’s longest-term residents and it undermines the credibility of this council’s collaborative aspirations. We’ve reached this situation because of years of neglect on this issue by Lambeth – punctuated only by its abortive permanency deals and promises. It can’t be right to betray communities and then purge them to raise funds through evictions…and in the process for Lambeth to pay out large amounts of money to lawyers, vacant property managers, contractors and auctioneers. 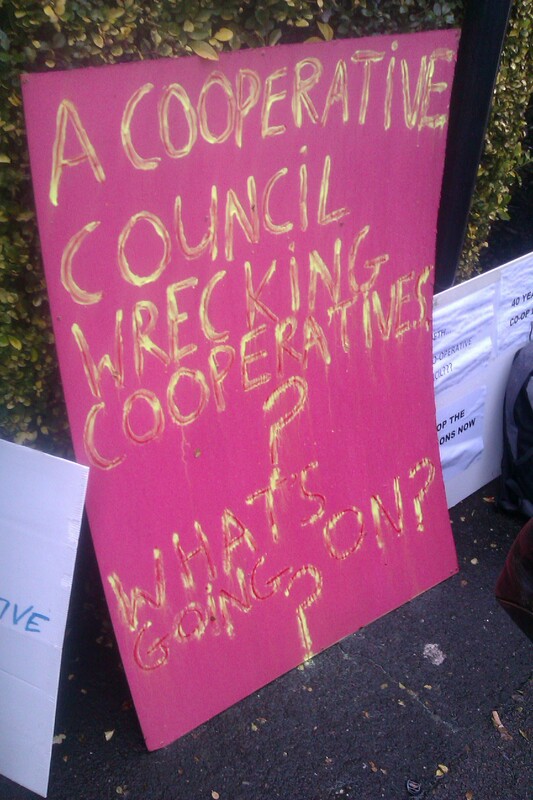 …first, how about some input from Lambeth’s own Co-operative Council Commissioners? Well, let’s hope he finds the new leadership more credible! Even the people who come to buy our houses are not impressed! “Why don’t they just give you tenancies?” one said. …and whoops there goes the neighbourhood! We are not asking for favouritism but the chance to continue living along co-operative lines. We are not asking the council to repair our homes, we want to continue to do this within a co-op – at no cost to the borough – and apply our experience to empty homes. So, Lambeth – rather than funding reserves and services through evictions – engage with the ‘Super Co-op’ solution that will both guarantee and extend social housing in the borough.